The popular Wednesday Night Drags program will kick off its 31st consecutive year at Sonoma Raceway on March 13, 2019. High school students will drag race against Bay Area law enforcement officers when the popular Top the Cops program returns as part of Sonoma Raceway’s weekly Wednesday Night Drags program, starting April 2019. 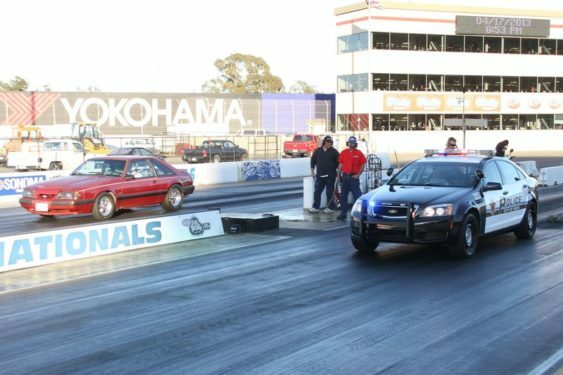 The Top the Cops program, which enters its 26th season this year, offers an alternative to illegal street racing and gives teens the chance to race against law enforcement officers, who compete in full uniform in their official vehicles on the quarter-mile drag strip. The program also provides a unique environment for the officers to talk with teens about safe driving and the rules of the road. The raceway will open its gates most every Wednesday night from March 13 – Nov. 13 for fans who would like to race down the world-famous quarter-mile drag strip. Drag racing staff can help you with staging your car at the starting line. After each run you’ll receive a time slip with your elapsed time and speed on the quarter-mile. Make it to the final four in your class and receive a trophy. Remember, it’s all about being consistent and getting good reaction times on the tree. Anyone with a driver’s license can compete, providing their vehicle or motorcycle passes a simple technical inspection. All vehicles must have mufflers. The event attracts a varied crowd, including teenagers, mothers, working professionals and grandparents racing everything from Corvettes to Mini-Vans. Three-hundred cars are allowed to compete each Wednesday night. The weekly event attracts an average of 900-1,200 people (competitors and spectators).